The vascular endothelium is a single layer of cells lining the inner surface of vasculature, which also plays an important role in cardiovascular homeostasis. In addition to maintaining vascular tone, the endothelial cell has antithrombotic, fibrinolytic, and anti-inflammatory effects. It also inhibits proliferation of underlying smooth muscle cells . Ex vivo assessment of endothelial function has been used since early 1980 by measuring the constriction and relaxation of isolated thoracic aortic ring with the application of acetylcholine (Ach) . Initially, endothelial function was assessed invasively by measuring vasomotor changes on endothelium during local administration of drugs, such as Ach, substance P, or bradykinin ,. Several noninvasive methods were developed over the past three decades. One commonly used measurement, flow-mediated dilatation (FMD), also called reactive hyperemia, assesses increases in the regional blood flow or vessel diameter after transient occlusion of upstream or downstream arteries. The increase in blood flow and also shear stress on the wall after reperfusion stimulate production and release of endothelium-derived nitric oxide, thereby causing vasodilatation . FMD is a simple and reliable method to assess endothelial function and nitric oxide bioavailability, with the use of ultrasonography or tonometry to record changes in vessel diameter or blood flow . From clinical observations, endothelial dysfunction occurs in the early stage of atherosclerosis and attenuation of FMD is associated with many atherosclerosis-related diseases ,. Since endothelial dysfunction predicts poor clinical outcomes or occurrence of atherosclerosis-related diseases ,,,,,, closely monitoring endothelial function may provide an early warning and an opportunity for early intervention. A growing number of therapeutic interventions (e.g., exercise, weight reduction, smoking cessation, and treatment with statins and angiotensin-converting enzyme inhibitors) are known to decrease atherosclerosis-related risks and also improve endothelial function in human subjects ,,. However, it is not easy to assess endothelial function in small animals, which is an important issue for drug development and exploration of disease pathophysiology. In rodents, most reported methods are invasive and require sacrificing the animals at each time point during the study ,,. The only method available for repeated assessment of endothelial function in living rats uses a 35-MHz high-resolution ultrasound imaging system to measure changes in the diameter of the femoral artery during FMD . It is time-consuming and must be performed by experienced technicians using expensive equipment. This system has been used in only a few studies . Here, we propose an instrument of novel design that uses infrared photoplethysmographic (PPG) sensors to provide easy and reliable measurements of endothelial function (i.e., FMD) in rats without the necessity to sacrifice animals at each time point and furthermore allows repeated measurements over a long period. We also proved that changes in volume flow are mostly mediated by endothelium-releasing nitric oxide. All animal procedures were approved by the Institutional Animal Care and Use Committee of Tzu Chi General Hospital (IACUC Approval No. 98-43-1). Male Wistar Kyoto (WKY) rats (6–9 weeks old) were purchased from the National Laboratory Animal Breeding and Research Center, Taipei, Taiwan. These animals were bred in a specific pathogen-free environment at 25°C with 12:12 h light-dark cycles and allowed free access to food and water in the Animal Center of Tzu Chi University. 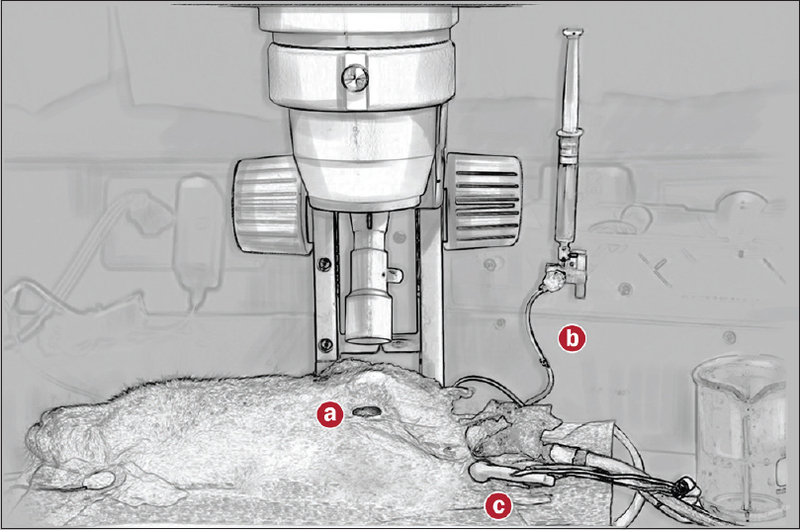 The animals were anesthetized with an intraperitoneal injection of sodium pentobarbital (50 mg/kg) and placed in a supine position on a heating pad maintained at 37°C . An infrared sensor was fixed on the footpad of the right hind limb [Figure 1]. The common iliac artery and its branch, the internal iliac artery, were isolated carefully under a dissecting microscope  [Figure 2]. A P10 polyethylene tube was inserted into this artery and attached to a 3-mL syringe. The syringe was fixed to an infusion pump (NE-1600 New Era Pump Systems Inc., NY, USA). An infrared sensor was attached to the footpad of the right hind limb [Figure 1]. The volume pulses were recorded by PPG, transmitted to a signal processing module containing a USB-6009 DAQ (National Instruments, Austin, TX, USA), and converted to digital signals as previously described . The signals were filtered with a band-pass of 0.3–3 Hz, amplified, and then processed to a personal computer for storage and analysis. It took about 30 min for cannulation and acclimatization. 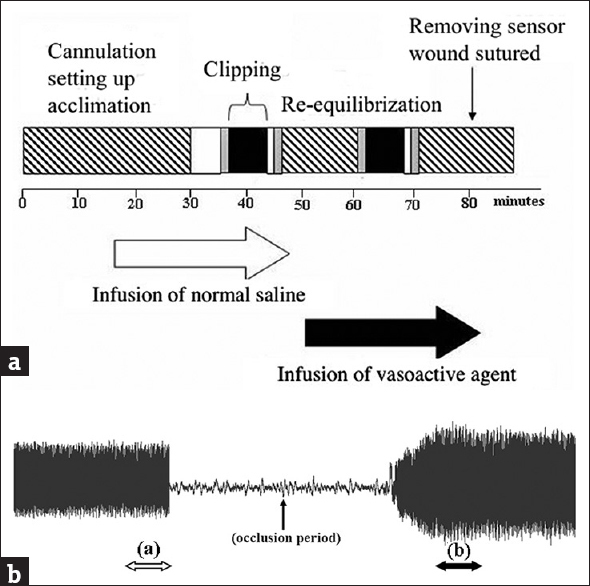 After cannulation, the animals received a continuous intra-arterial infusion of normal saline at a rate of 10 μL/min. After pulse stabilization (about 5 min), the baseline volume pulses were recorded for 1 min. 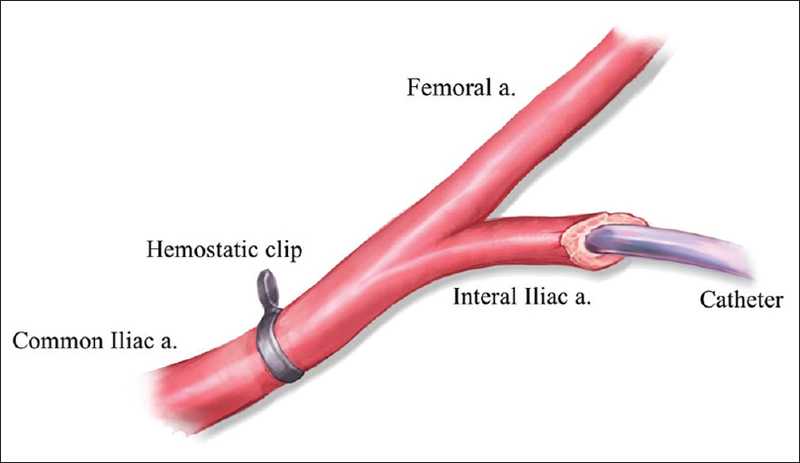 Then, the external iliac artery was occluded using a hemostatic clip at the proximal site for 5 min [Figure 3]a. The dilatation index (DI) was calculated as the ratio of the mean pulse amplitude recorded during a 1-min period 1 min after release of the clip to the 1-min mean pulse amplitude before occlusion of the artery [Figure 3]b . After recording the baseline DIs, the animals received an intra-arterial infusion of Ach (Sigma-Aldrich, St. Louis, MO, USA), sodium nitroprusside (SNP, Mayne Pharma Pty Ltd, Melbourne, Victoria, Australia), or a nitric oxide synthase inhibitor, N ∞-nitro-L-arginine methyl ester (L-NAME, Sigma-Aldrich, St. Louis, MO, USA). The infusion rate was 10 μl/min at a dosage of 1 μg/min for Ach, 1 μg/min for SNP, and 1.7 μg/min forL-NAME . The same procedures were repeated to check DIs during infusion of each drug. To test reliability of the measurements, two consecutive measurements of the DI were performed in the right and left hind limbs of five rats at an interval of 1 week. The agreement of the measurement was demonstrated by Bland–Altman plotting. All data are expressed as mean ± standard deviation. To check the reliability of the measurement, we performed linear regression between the first and second measurements. We used Student's t-test to check the difference in the DIs between the left and right side. The effects of drugs on FMD were assessed by comparing the FMD before and during infusion of the agents, and changes in FMD were analyzed with the nonparametric Mann–Whitney U-test. 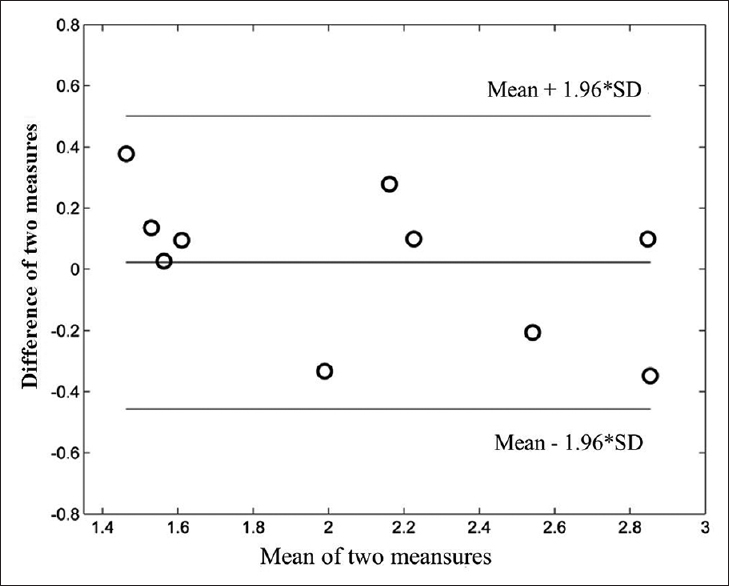 The homogeneity of baseline DIs was examined by one-way analysis of variance (ANOVA). All analyses were performed using SPSS (version 10.0, SPSS, Inc., Chicago, IL, USA). Statistical significance was accepted at P < 0.05. Two consecutive measurements of FMD were carried out on both sides of five rats, and therefore, 10 DIs were calculated the first time. One week later, FMDs were measured again. Ten more measurements were recorded in the 2nd week. There was very good agreement between the first and second measurements as assessed by Bland–Altman plotting [Figure 4]. There was no significant difference in measurements between sides (2.03 ± 0.69 vs. 1.83 ± 0.56; P = 0.94). Twenty-four WKY rats were divided into three groups of eight. DIs did not differ before infusion of the drugs (P = 0.877, by one-way ANOVA). DIs were increased from 1.82 ± 0.46 (at baseline) to 2.97 ± 1.03 (P = 0.015) during infusion of Ach, were unchanged (1.81 ± 0.44 vs. 1.98 ± 0.40; P = 0.574) after infusion of SNP, and were decreased (1.91 ± 0.40 vs. 1.42 ± 0.35; P = 0.028) after infusion ofL-NAME. 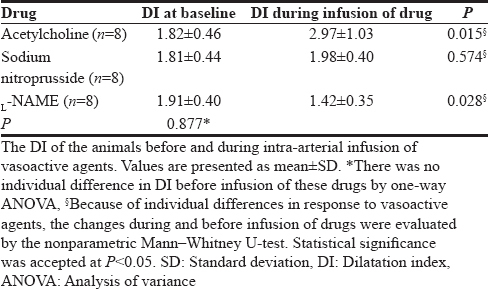 Although the baseline DI was higher in animals infused withL-NAME than in animals infused with Ach or SNP, the difference was not statistically significant by one-way ANOVA [Table 1] and [Figure 5]. PPG is a simple optical technique that has been used to detect changes in microcirculatory perfusion in many tissues, including the fingertips and earlobes. With the advantages of low cost, simple manipulation, and portability, PPG instruments with red or infrared sensors have been used to measure oxygen saturation, blood pressure, cardiac output, and autonomic function . We have used a dual-channel PPG to measure the pulse-wave velocity in humans. These acquisitions and measurements of PPG have been shown to be reliable and reproducible ,. In this study, we used a modified instrument to measure endothelial function in anesthetized adult WKY rats using infrared PPG to detect blood flow volume changes in the footpad. There are several definitions of DI, using either the ratio of the peak increase of blood flow after a hyperemic test to the baseline blood flow or the average of the pulse amplitude in a time interval to the mean amplitude at baseline ,. In human study, DIs recorded during the 90–120-s postdeflation period had the strongest correlation with cardiovascular risk factors . However, there is no established definition of DI for rats. The only study in which the DI in rats was measured with ultrasonography used the ratio of the maximal diameter to the baseline diameter after the hyperemic test to the baseline diameter . We followed the protocol published by Nohria et al. to estimate the DI and used the ratio of the average amplitude of the pulse wave volume over a 1-min period starting 1 min after release of the hemostatic clip divided by the average of the pulse amplitude during a 1-min interval before occlusion of the artery . Many factors affect the reproducibility of PPG, such as environmental temperature, proper sensor attachment, motion artifacts, and the subject's posture, breathing, and wakefulness . In this study, we showed that excellent reproducibility could be achieved under general anesthesia and controlled room temperature conditions. Moreover, this instrument can be used for long-term and dynamic in vivo studies of endothelial function in small animals. FMD is mainly mediated by the release of endothelial nitric oxide. In this study, we used three vasoactive agents to confirm that the volume pulse signal changes that we recorded by infrared sensors were also mediated by nitric oxide. [Figure 5] shows their effects on the DI. The endothelium-dependent vasodilator Ach increased DI significantly. In contrast, intra-arterial infusion ofL-NAME, a nitric oxide synthase inhibitor, attenuated flow-mediated dilatation. Another vasodilator, SNP, acting on vascular smooth muscle cells directly, did not affect the DI. These findings proved that the FMD data obtained by measurement with infrared PPG were similar to those obtained using other devices such as tonometry or high-resolution ultrasound in humans and rats ,. Because the worldwide mortality and morbidity of atherosclerosis-related diseases is increasing, the development of noninvasive monitoring of progression of atherosclerosis has become a very important issue for prevention and early treatment of these diseases. Dysfunction of the vascular endothelium has been shown to be the earliest change in atherosclerosis from clinical observations over three decades ,. It has been proved that FMD is a reliable assessment of the bioavailability of endothelial nitric oxide. Impaired FMD in asymptomatic individuals correlates with cardiovascular risk factors such as hypertension, insulin resistance, diabetes mellitus, elevated serum low-density lipoprotein, smoking, and even sedentary lifestyles. Therefore, FMD was recently recommended as a valid parameter in the noninvasive assessment of subclinical atherosclerosis in children and adolescents . Although therapeutic targeting on vascular endothelial dysfunction has been proposed as a useful strategy in the treatment of atherosclerosis and related diseases ,,, long-term evaluation of the therapeutic impact on endothelial function in clinical studies is not easy. In addition, the causes of atherosclerosis such as genetic polymorphism or environmental toxins, diet, and oxidation stress are difficult to assess in human subjects. The use of a physiologically and genetically similar animal model, therefore, can serve this purpose. Several animal models of atherosclerosis are available for intervention studies ,, but few reliable, noninvasive methods can be used to assess endothelial function. To overcome this limitation, we developed the aforementioned instrument for reliable and easy assessment in long-term monitoring of endothelial function in animal models. This can offer a deeper understanding of the disease process and guide further pharmacological and interventional treatment strategies against atherosclerosis. We designed a reliable instrument to assess endothelial function in small animals using an infrared pulse detector. Similar to that in human beings, the FMD acquired with our system was shown to be mainly nitric oxide mediated. This instrument can be used for the study of the pathogenesis of atherosclerosis through assessing changes in endothelial function and evaluating the efficacy of therapeutic regimens against atherosclerosis in animal models. We acknowledge Miss Szu-Hsuan Chen for her expert technical assistance in animal study. This work was supported by a grant from the National Science Council, Taiwan (NSC99-2221-E-303-001), and an intramural grant from Buddhist Tzu Chi General Hospital, Hualien, Taiwan (TCRD101-16). Davignon J, Ganz P. Role of endothelial dysfunction in atherosclerosis. Circulation 2004;109:III27-32. Furchgott RF, Zawadzki JV. The obligatory role of endothelial cells in the relaxation of arterial smooth muscle by acetylcholine. Nature 1980;288:373-6. Cox RH, Haas KS, Moisey DM, Tulenko TN. Effects of endothelium regeneration on canine coronary artery function. Am J Physiol 1989;257:H1681-92. Ludmer PL, Selwyn AP, Shook TL, Wayne RR, Mudge GH, Alexander RW, et al. Paradoxical vasoconstriction induced by acetylcholine in atherosclerotic coronary arteries. N Engl J Med 1986;315:1046-51. Joannides R, Bellien J, Thuillez C. Clinical methods for the evaluation of endothelial function – A focus on resistance arteries. Fundam Clin Pharmacol 2006;20:311-20. Ghiadoni L, Versari D, Giannarelli C, Faita F, Taddei S. Non-invasive diagnostic tools for investigating endothelial dysfunction. Curr Pharm Des 2008;14:3715-22. Vallance P, Chan N. Endothelial function and nitric oxide: Clinical relevance. Heart 2001;85:342-50. Deanfield JE, Halcox JP, Rabelink TJ. Endothelial function and dysfunction: Testing and clinical relevance. Circulation 2007;115:1285-95. Yeboah J, Sutton-Tyrrell K, Mcburnie MA, Burke GL, Herrington DM, Crouse JR, et al. Association between brachial artery reactivity and cardiovascular disease status in an elderly cohort: The cardiovascular health study. Atherosclerosis 2008;197:768-76. Stenborg A, Kalimo H, Viitanen M, Terent A, Lind L. Impaired endothelial function of forearm resistance arteries in CADASIL patients. Stroke 2007;38:2692-7. Brunner H, Cockcroft JR, Deanfield J, Donald A, Ferrannini E, Halcox J, et al. Endothelial function and dysfunction. Part II: Association with cardiovascular risk factors and diseases. A statement by the Working Group on Endothelins and Endothelial Factors of the European Society of Hypertension. J Hypertens 2005;23:233-46. Cohn JN, Quyyumi AA, Hollenberg NK, Jamerson KA. Surrogate markers for cardiovascular disease: Functional markers. Circulation 2004;109:IV31-46. Bonetti PO, Lerman LO, Lerman A. Endothelial dysfunction: A marker of atherosclerotic risk. Arterioscler Thromb Vasc Biol 2003;23:168-75. Chen PL, Wang PY, Sheu WH, Chen YT, Ho YP, Hu HH, et al. Changes of brachial flow-mediated vasodilation in different ischemic stroke subtypes. Neurology 2006;67:1056-8. Widlansky ME, Gokce N, Keaney JF Jr., Vita JA. The clinical implications of endothelial dysfunction. J Am Coll Cardiol 2003;42:1149-60. Davis CR, Bryan J, Hodgson JM, Woodman R, Murphy KJ. A Mediterranean diet reduces F2-isoprostanes and triglycerides among older Australian men and women after 6 months. J Nutr 2017;147:1348-55. Alqurashi RM, Galante LA, Rowland IR, Spencer JP, Commane DM. Consumption of a flavonoid-rich açai meal is associated with acute improvements in vascular function and a reduction in total oxidative status in healthy overweight men. Am J Clin Nutr 2016;104:1227-35.
de Queiroz DB, Ramos-Alves FE, Santos-Rocha J, Duarte GP, Xavier FE. Losartan reverses COX-2-dependent vascular dysfunction in offspring of hyperglycaemic rats. Life Sci 2017;184:71-80. Marchesi C, Ebrahimian T, Angulo O, Paradis P, Schiffrin EL. Endothelial nitric oxide synthase uncoupling and perivascular adipose oxidative stress and inflammation contribute to vascular dysfunction in a rodent model of metabolic syndrome. Hypertension 2009;54:1384-92. Chen Q, Sievers RE, Varga M, Kharait S, Haddad DJ, Patton AK, et al. Pharmacological inhibition of S-nitrosoglutathione reductase improves endothelial vasodilatory function in rats in vivo. J Appl Physiol (1985) 2013;114:752-60. Heiss C, Sievers RE, Amabile N, Momma TY, Chen Q, Natarajan S, et al.In vivo measurement of flow-mediated vasodilation in living rats using high-resolution ultrasound. Am J Physiol Heart Circ Physiol 2008;294:H1086-93. Schuler D, Sansone R, Freudenberger T, Rodriguez-Mateos A, Weber G, Momma TY, et al. Measurement of endothelium-dependent vasodilation in mice – Brief report. Arterioscler Thromb Vasc Biol 2014;34:2651-7. Wu HT, Liu CC, Sun CK, Liu AB, Chen CS, Yang CC, et al. Simultaneous assessment of autonomic nervous and vascular endothelial functions in a rat model. Biomed Tech (Berl) 2013;58:205-12. Kochi T, Imai Y, Takeda A, Watanabe Y, Mori S, Tachi M, et al. Characterization of the arterial anatomy of the murine hindlimb: Functional role in the design and understanding of ischemia models. PLoS One 2013;8:e84047. Kuvin JT, Patel AR, Sliney KA, Pandian NG, Sheffy J, Schnall RP, et al. Assessment of peripheral vascular endothelial function with finger arterial pulse wave amplitude. Am Heart J 2003;146:168-74. Rahmouni K, Jalali A, Morgan DA, Haynes WG. Lack of dilator effect of leptin in the hindlimb vascular bed of conscious rats. Eur J Pharmacol 2005;518:175-81. Allen J. Photoplethysmography and its application in clinical physiological measurement. Physiol Meas 2007;28:R1-39. Liu AB, Hsu PC, Chen ZL, Wu HT. Measuring pulse wave velocity using ECG and photoplethysmography. J Med Syst 2011;35:771-7. Tsai WC, Chen JY, Wang MC, Wu HT, Chi CK, Chen YK, et al. Association of risk factors with increased pulse wave velocity detected by a novel method using dual-channel photoplethysmography. Am J Hypertens 2005;18:1118-22. Joannides R, Haefeli WE, Linder L, Richard V, Bakkali EH, Thuillez C, et al. Nitric oxide is responsible for flow-dependent dilatation of human peripheral conduit arteries in vivo. Circulation 1995;91:1314-9. Hamburg NM, Keyes MJ, Larson MG, Vasan RS, Schnabel R, Pryde MM, et al. Cross-sectional relations of digital vascular function to cardiovascular risk factors in the Framingham heart study. Circulation 2008;117:2467-74. Nohria A, Gerhard-Herman M, Creager MA, Hurley S, Mitra D, Ganz P, et al. 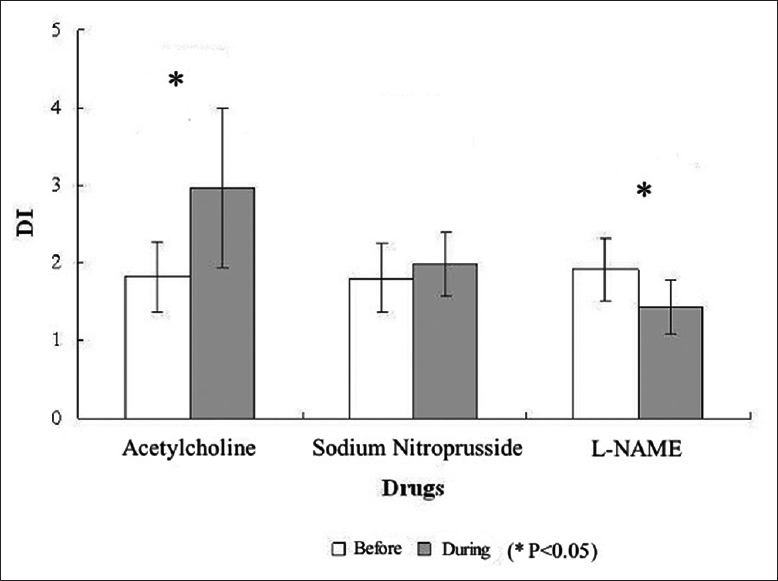 Role of nitric oxide in the regulation of digital pulse volume amplitude in humans. J Appl Physiol (1985) 2006;101:545-8. Urbina EM, Williams RV, Alpert BS, Collins RT, Daniels SR, Hayman L, et al. Noninvasive assessment of subclinical atherosclerosis in children and adolescents: Recommendations for standard assessment for clinical research: A scientific statement from the American Heart Association. Hypertension 2009;54:919-50. Pizzi C, Mancini S, Angeloni L, Fontana F, Manzoli L, Costa GM. Effects of selective serotonin reuptake inhibitor therapy on endothelial function and inflammatory markers in patients with coronary heart disease. Clin Pharmacol Ther 2009;86:527-32. Siasos G, Tousoulis D, Vlachopoulos C, Antoniades C, Stefanadi E, Ioakeimidis N, et al. The impact of oral L-arginine supplementation on acute smoking-induced endothelial injury and arterial performance. Am J Hypertens 2009;22:586-92. Schroeter H, Heiss C, Balzer J, Kleinbongard P, Keen CL, Hollenberg NK, et al. (-)-epicatechin mediates beneficial effects of flavanol-rich cocoa on vascular function in humans. Proc Natl Acad Sci U S A 2006;103:1024-9. Wang Z, Zou J, Cao K, Hsieh TC, Huang Y, Wu JM, et al. Dealcoholized red wine containing known amounts of resveratrol suppresses atherosclerosis in hypercholesterolemic rabbits without affecting plasma lipid levels. Int J Mol Med 2005;16:533-40. Matsumoto M, Sata M, Fukuda D, Tanaka K, Soma M, Hirata Y, et al. Orally administered eicosapentaenoic acid reduces and stabilizes atherosclerotic lesions in ApoE-deficient mice. Atherosclerosis 2008;197:524-33.